Swimming pools require a good portion of effort if you want to keep it in a good shape, healthy and clean to be able to enjoy it any time you want to. It can be also quite expensive. Using a pool cover could help you with that. It will not only slow down the cooling process of your swimming pool, but also will help you with other pool related actions, and make it as easy as it can be. In this article you’ll read about these reasons, so you’ll know why it is more than good idea to get it rather sooner than later. The term “evaporation” is not just something from our Biology books, it is a process which is happening in your pool as we speak. You can’t prevent it, but you could slow it down. It happens when liquid changes into a vapor, and direct sunlight speeds it up. By covering your pool you slow down this process as much as possible. Chemicals are needed to keep your pool water levelled and good enough to swim in it without having red eyes, sneezing, or some kind of allergy or asthma reaction. Direct sunlight speeds this process up, so by covering your pool you’ll reduce chemical consumption from 35 – 60 percent and keep your water optimal for longer period of time. It means less chemicals needed – less money spend. And less unpleasant surprises after testing. During the night, the temperature outside drops, so your pool will cool down and you’ll need more time to heat it when you decide to go for a swim. Pool covers slow this process enough to keep it heated enough for you to jump back in it. Also, it is worth noting that this helps you save electricity or gas you’ll use to warm it up, so it is good for your wallet. As the wind blows, it will sooner or later blow some leaves, debris or some other garbage into your pool, so you’ll have to spend time cleaning it. Also, there are a few kinds of bugs and insects who love water, or are just trespassing by, and if they fall into your pool you’ll have to “fish” them out using your skimmers. Pool cover prevents them from getting in, and keeps the leaves, debris and other unwanted objects away from water. You’ll only have to clean the cover, not the whole pool. It will take only a few minutes of your time, and you could spend the rest of your time using your pool for what it is made for – swimming, instead of chasing stuff in it. And the only floating things will be the ones you’ve placed inside the pool intentionally. The upper argument is directly connected to another great pool cover benefit – you’ll vacuum far less. Vacuuming the swimming pool can be complicated, it also takes lots of time and it means you’ll have to refill your pool with fresh water when done. And most of the time, the reason we vacuum it are leaves and debris we can’t get out the other way. As mentioned above, pool cover will keep them outside, so you’ll vacuum only when you have to. Swimming pool maintenance isn’t just time-heavy, it also costs a lot. Reduced usage of heater needed, less water used, less chemicals… And not just that, it also lowers your electricity or gas bills. Add it all up, and you’ll see how much money you’ve saved. 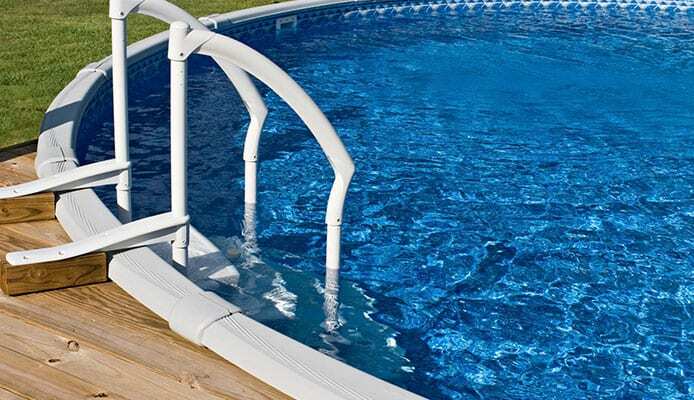 Most of the covers are made of fiberglass and they’ll keep someone from falling into the pool if installed properly. Some of them could even hold up to 400 pounds per square foot. Although these covers are heavy and require track system (whether manual or automatic), they’re worth the effort. 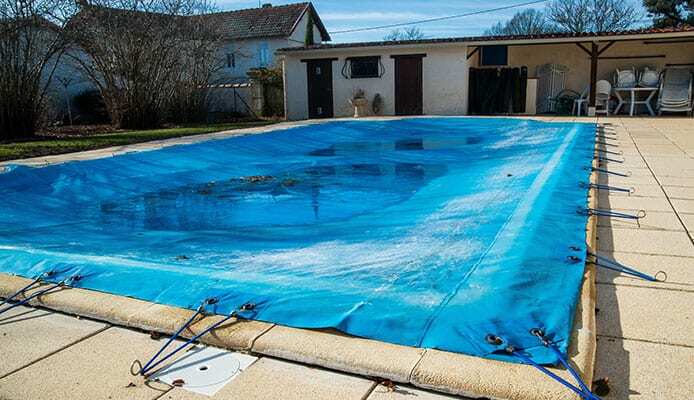 The others, like tarp or solar covers, do not have that ability, so if you’re looking for the one that will keep your guests safe from an unintentional falling into the pool, make sure they are not made of tarp, solar or something light. If you get the automatic track cover, it will only take a press of a button to start it up. Manual ones take a little more time and effort, but removing it and placing it back on should not be a problem, and you’ll have your pool ready for swimming in a no time. Chlorine is one of the main necessities in keeping your pool water healthy. It is main water sanitiser, but the direct sunlight degrades it. Pool covers deflect it and keep it away, so you don’t lose so much chlorine and keeps the level of it optimal for the longer period of time. If you have a salt water pool, it means your chlorinator doesn’t use as much energy as it would without the cover. 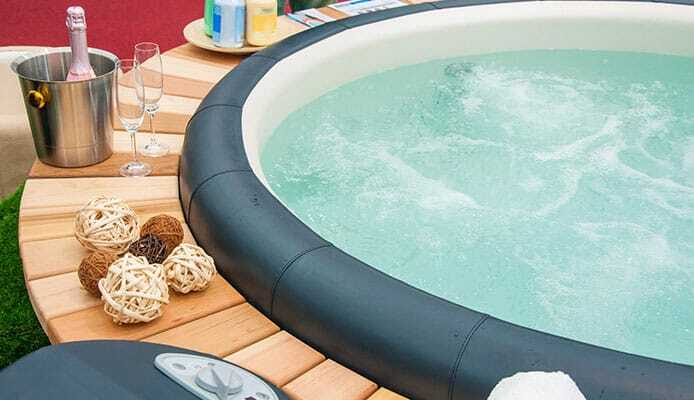 As stated above, covered pool suffers less evaporation, the sun consumes less chlorine, leaves and debris are kept away so the flow, filters or the pump won’t get blocked, water level won’t become too low, so it requires less regular supervision and daily care. This also means you won’t have to worry about these problems while you’re on holiday or simply have no time to take care of your pool right now. Being useful as it is, pool cover has its cons and side effects. Some of them are justified, some are not, but it is important to know “the whole picture” before you decide to purchase one. Some pool owners don’t like pool covers because they affect the look of their pool. But it is important to know there are lots of different colors, or you could even find a place which makes them the way you want if you don’t like blue, green or white covers. If it is hot outside and you’ve just got back home from work, you’ll probably want to hit the pool instantly, so bothering with covers seems like too much work. The solution is to get an automated track cover which is then controlled by simple button pushing. It is a bit less spontaneous but will help you overall. When you buy the pool cover, you’ll need to find the place where you’ll keep the cover when you remove it from the pool. And because the space within the pool fence can be limited, the roller could restrict the access to the pool. Some of the covers, like bubble covers, need to be covered and kept away from the sun as long they’re on the roller to prevent them from being damaged and break. If you have a typical, rectangular pool, you’ll probably have no problem finding the right cover for your pool. But if it is shaped like a kidney bean, simply curved or is any kind of custom shaped, it can be a bit harder to find cover for it. Of course, there are places who make covers based on your pool shape, so it is not impossible to find it, but it will take some time to find the right place and will probably cost more. Covering your pool seems expensive and requires a lot of effort at first, but if you take all the pros and cons into consideration, it can be one of the best purchases you’ll ever make. It will not only keep your pool in a better shape than it is without it by slowing evaporation down, keeping the insects, leaves and debris out, retaining its temperature for the longer period of time, but also keep your bank account happy and your wallet full. So, if you’re thinking whether to get one or not, take a piece of paper and make a “pros” and “cons” list. If you prefer to keep your pool uncovered because of the view, you’ll probably want to skip getting a cover. But if you want to keep your pool clean, or you don’t want to worry about the possibility of different things getting into your pool, thinking about getting one is a good option. Now when you know all the pros and cons, it is up to you to decide.